Living, Loving, Laughing, & Creating Everyday: Melted Crayon Ornaments! Living, Loving, Laughing, & Creating Everyday is a place to document this crazy ride I call life. Sometimes is up, sometimes it's down...but it's always full of laughs! It may be wrong - but I love to melt crayons!!! This Pinterest inspired project is Hot! Literally! But so much fun! What you will need: Clear glass ornaments, crayons, and a hair dryer. Put the top back on and hold by the top. Apply heat to the crayons until they begin to melt. Spin or twirl the ornament to allow the crayon to spread around the ornament. Careful! It does get hot! What type of crayons are you using? We've tried the melted crayons before on pumpkins and they were all lumpy and greasy looking. Maybe didn't have the right "type" of crayons? I definitely use Crayola crayons. I might have had some other in my box of crayon scraps but I always pick out the Crayola - they melt the best and solidify the best. Ive used dollar store crayons and they dont melt as nice as the crayola. Definetly use crayola. The secret is not to use any CHEAP waxies. The pigment in them is different and powdery. Also cheaper waxies are not Bees Wax - they are usually paraffin wax. They don't work properly. The washable crayons don't work as well. Can you use the sparkle crayons? I would use the Crayola too, but have you tried the glitter ones? I LOVE your idea!! Definitely trying the glitter crayons!! GENIUS! You could also do a similar project with tempera paints! Like the crayons, a few drops into the ball, and swirl them around. Turn them upside down on egg crates to let the paints dry (and any excess to drip out). Advantage of the paints, would be safer to do with children where you might not want them handling the melted crayon wax or hot ornaments. Very true! If I were doing this with my students I would do it with the paint...but this one was for the big kid - me! :) and I like to play with melted crayons! Me and my cuzin found a project with crayons and it wont work cuz my hairdryer wont melt them dang crayons! Plz help me! I have done this with the paint, & don't really recommend it. When I unpacked them the following year, all the paint had peeled away. Use acrylic paint instead of tempura--ours have lasted 3+ years and haven't peeled. I think paint would work best for me. I'd love to do the crayons, but I live in Florida and our attic (where we keep all of our holiday stuff) can get to be extremely hot. The crayons would for sure melt up there. I'd do acrylic since I don't have to worry about kids and toxicity. what about during the summer when it is all packed away,,, doesn't the crayons melt again from the heat of summer and clump at the bottom? Theresa, I have a big kid in me too obviously. I love melted crayon projects and this one sounds really fun. I will do these with my kids next year for my mom. She loves home made gifts. 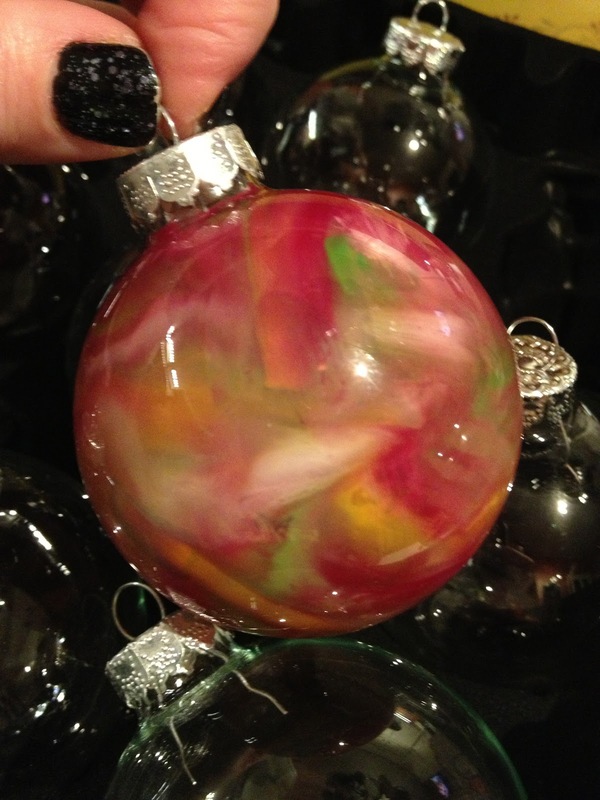 We used the same glass ornaments this Christmas with alcohol ink and a can of compressed air to blow it around. Do a color, let it dry, then layer with another color, they came out beautifully. My 6 year old son made them for his gifts this year. I can't wait to try these with him! I will have to try this idea! Is this time consuming to do? How long does it take before the bits start to melt? I mean, is it like a one minute per bulb type thing, or more like 10 minutes? Just to have an idea... Thanks! Terese - It's pretty quick once it starts melting. Depending on the heat setting on the hair dryer, it begins to melt within about 20 seconds. I'd say the whole melting part takes no more than 2-3 minutes. 20 secs?? REALLY?? I just tried this yesterday and it did NOT work. I waited about 10 minutes before the crayon even started to melt a little and it did not just flow around and look pretty. I got frustrated and stopped. This is a gorgeous project but with kids it is just ridiculous to have them stand blowing a hot hair dryer on glass for 10+ mins. I was VERY disappointed and yes Crayola crayons were used. I think this is a awesome family project.I have a daughter and she loves doing crafts.But we haven't done this before is it hard? Just wondering if the crayon is smaller dose it melt faster? It's not hard but could be hot for young ones. Make sure to hold the ornaments yourself - perhaps she can hold the blow dryer. Yes the smaller the pieces will melt faster. Would they hold up to the heat? I just tried the plastic ball and it did great with the hair dryer. Just have to figure out a way to hold it since the metal top gets hot. Use tweezers to hold the top. maybe try cotton gloves..for you and kids? I might try this with my 2 boys...! I tried plastic and the balls melted while the Crayolas didn't! Big mess...then, I used acrylic paints and a week later, still a wet mess inside. Threw them all out. Love the idea for the ornaments but I have to tell you, I LOVE your background on this site. Bold and bright. Makes you want to get creative with something. Thanks! I created it on the iPad with the Brushes app. Its a beautiful background. I haven't tried designing on an ipad ...enjoying the ideas and sugestions for the ornaments acrylic paint works. Glitter can be added at the same time..my daughter and I expeimented with it and has lasted for years. Will the color stay like that forever???? When I tried acryllic paint the lights made all the paint sink to bottom. They were pretty until then. Got a question....im thinking of trying this as centerpieces on a table since we are going with a "galaxy" theme. Any ideas on how to incorporate lights to make them glow??? If so will the light be able to show through the paint or crayons???? Using glitter crayons could work well to look like little stars. Depending on how the centerpiece is arranged, is there a way to use a string of battery-operated white lights? How do these hold up in the long run? I'm afraid the wax would crack when stored. I melted crayons and swirled leaving spaces in it and then did the glitter inside, they turned our really cool. If you store these little cuties in your attic after Christmas, the summer heat might just melt the wax again. Yuck. Do you melt them all the way? Melt them until you like the look and then pull the heat away to cool. It's okay to leave some not totally melted as long as you like the look. Question, Can you do another color after the first coat is dry? Mixed my colors but they all turned out all one color. Make sure to choose colors that will mix together well and know when to pull the heat away. You want them to swirl around not totally mix together. Use small broken pieces. It depends on how big your ornament. You can always add another piece in and add heat again...just know that it will melt the other colors again so be sure and move the glass around to let them all melt and swirl around. Please help! I tried to make one yesterday, and think I may have used too many crayons! How many do you use generally. The crayons covered the ball inside, but they were not easy to swirl, and as it dried there were several spots that had the clear glass showing again. 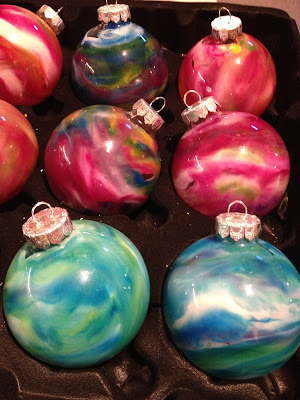 My plastic ornaments melted- paint worked very well!! Any hair dryer works. Anything stronger or hotter will burn you and heat your craft to the point of ruin. Be safe! We've actually found that embossing gun works faster. I've been doing them with that lately. What a big collection of ideas there Mel! We did a fun class making these at our ArtsyBug Studio. Glass would be better to use. thanks for the wonderful idea!! made a few for gifts, then it snowballed into extra Christmas cash. even added some crystal beads for initials then some ribbon to finish it. I found that using an old cheese grater works well for getting crayon bits. Also, to prevent the crayon dust from collecting in a lump at the bottom, first rinse the inside of the ornament with warm water first. Drain the water and then use a funnel to put in the dust and roll around so it sticks to the sides before applying heat. I have tried that.It is super cool and is on my Christmas tree every year. Thanks for sharing this. I have discover some web site which are also offering this kind of Christmas gift in affordable price.just visit once. Where do you find clear glass ornaments? Amazon carries them as well. This idea is great! i really enjoyed doing it with my daughter.The colours did not mix as well,But it turned out really good!! Maybe a dumb question but will plastic balls work? Mine melted before the crayons and paint never dried! Theew it all away. I did this with my grandson a couple of years ago for everyone in the family & then used a silver or gold sharpie & put their name on one side & from "grandson's name & year on other side. Let him wrap them with colored tissue paper & just put in plain white bags. Made gift tags with him that I just cut from colored computer paper & let him write who it was to & from. He enjoyed it so much & everyone in the family lived them. I will caution the glass gets very hot. I had to do the melting & had to end up putting on a pair of winter gloves to keep from burning myself. A pot holder was too bulky. It was also a great afternoon spent at Grandma's house. I suggested this to my middle school art teacher and now we are going to do it for an art project before Christmas!! Thanks for the AWESOME idea!!!! Can I use plastic ornaments instead of glass? Wondering.the same thing especially if you use acrylic paint instead. Where can clear glass ornaments be purchased? Do they have to be glass? So glad the weather is turning warmer - it's been a long cold winter season. Welcome Spring and Summer! With the changing of the seasons we embrace changes in our lives. My baby boy is now a grown man in the Navy. The end of a school year brings up possibilities of changing schools next year. 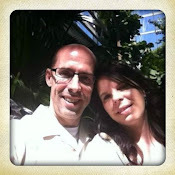 But most importantly - We have taken a leap and are starting our own Art Studio to teach classes to all ages. I will continue to teach in the district, but we hope this is a new, fun, and profitable endeavor.